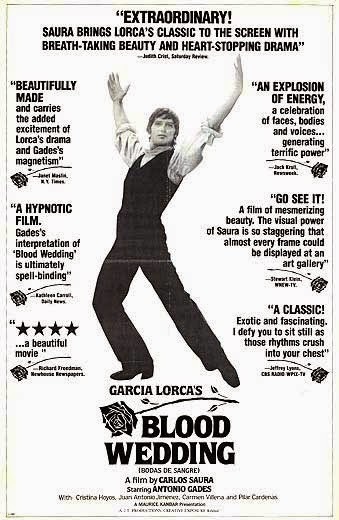 Carlos Saura, who was hitherto known for his political meditations condemning Franco’s regime, made a radical thematic turn with his celebrated ‘Flamenco Trilogy’, which comprised of Blood Wedding, Carmen and El Amor Brujo. However, given Franco’s political appropriation of the iconic Spanish dance form, it might not be as dramatic a departure after all. Made in cinéma vérité style and with tight spatial and temporal scope, was this was the simplest of the lot structurally, and that imbued it with a striking sense of cinematic purity and actor-audience interaction. It depicted a single dress rehearsal of famous dancer and choreographer Antonio Gades’ adaptation of Federico Garcia Lorca’s earthy and emotionally ebullient drama on passionate revenge. The film was entirely set within the make-up room and a sparse rehearsal hall, based over a few hours within a single day, and comprised of actors who we don’t get to know personally; further, a reasonable awareness of the play being staged is important if not compulsory to fully appreciate the proceedings. What, therefore, entailed of us was in literally being active witnesses to certain snippets from the troupe’s session. Saura’s experiences as a photographer was evident from the way the incredibly fluid camera followed the dancers by being at sync with their movements and marvelously captured the moments – the freeze frame representing a photo-shoot reminded me of The Last Supper shot in Bunuel’s Virdiana – and emotions of the play’s basic plot through Cristina Hoyos as the bride, Gades as the lover and characters playing the husband, the bride’s mother, the lover’s wife and village folks The excellent music and dance performances added to make this a dazzling elucidation of this formally unique endeavour.